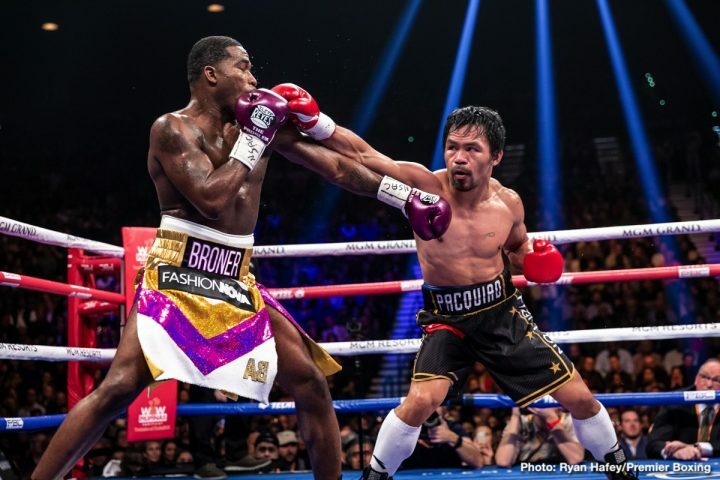 By Chris Williams: Early estimates of last Saturday’s fight between WBA welterweight champion Manny Pacquiao and Adrien ‘The Problem’ Broner is the fight brought in over 400,000 pay-per-view buys on SHOWTIME, according to Mike Coppinger. If these numbers turn out to be correct, it means that Pacquiao is still a huge draw for PPV, since he didn’t get much help. Pacquiao likely would have done a lot more pay-per-view buys against Errol Spence Jr., Terence Crawford, Mikey Garcia, Keith ‘One Time’ Thurman or Shawn Porter. Those are all relevant fighters at 147. 400,000 buys represents an outstanding number for Pacquiao-Broner. When you take in the fact that Broner had arguably lost 3 out of his 6 fights going into last Saturday’s fight with Pacquiao, it says a lot that they were able to draw 400,000 buys. Those are the type of numbers that one would expect to see from a competitive match-up between two talented fighters, not a glorified mismatch like the one the boxing world saw last Saturday with Pacquiao beating the brakes of Broner from start to finish. Aside from Saul Canelo Alvarez, Pacquiao is the next biggest PPV attraction in Northern America. When matched against the right opponent, Pacquiao is still capable of bringing in a lot of PPV buys. It’s going to take a talented fighter like Spence, Thurman, Crawford, Porter or Mikey for Pacquiao to bring in the kind of PPV numbers that he used to during the height of his fame. Pacquiao beat Broner handily by the scores 117-111, 116-112 and 116-112. Those scores were VERY kind, considering that Broner fought well enough to win one round under the best estimates. Adrien landed a couple of good shots in round 4, and that was the only round that he came close to winning. Pacquiao still out-landed him by a margin in the fourth, and if there’s a round to give him, it would be that one if you ignored the wide disparity in punches landed. Pacquiao is still a huge draw in boxing. He just needs the right opponent for him to get back up to the 1 million mark in PPV buys that he routinely used to bring in for his fights. Back when Pacquiao was at his height of his career, 400,000 would have been an off night Even the 700,000+ PPV buys Pacquiao brought in against Joshua Clottey was below what he’d been doing. If Pacquiao can bring in 400,000 buys for a fringe level fighter like Broner, it shows that he’s still a big PPV attraction in boxing. That’s not a knock on Broner, but he’s clearly not an elite level fighter at 147 in this era. Maybe if Broner could go on diet and drain back down to 130, he could be a factor at super featherweight, but he’s not one of the elite at welterweight or light welterweight. The casual boxing fans likely didn’t purchase the Pacquiao-Broner fight due to Broner, because it’s been ages since Broner did anything with his career. The fans were caught up in Manny hysteria, this is like a mania with boxing fans. They’ve been excited at Pacquiao’s career resurgence since his 7th round knockout win over Lucas Matthysse last July. It wouldn’t have likely mattered who was carted into the ring with Pacquiao last Saturday night at the MGM Grand in Las Vegas. A large number of boxing fans were going to purchase the fight. Why was Broner picked for Pacquiao instead of someone else? You can argue that Broner was selected for Pacquiao because he was a beatable guy, that Pacquiao could beat for sure without any risk of losing. At the same time, Broner is able to attract some interest with his trash talking that he does during press conferences. Broner has always been able to attract excitement during his career. When Broner was at his best fighting at super featherweight and lightweight, he could back up his bold talk inside the ring. That made him a a star in the making. Broner’s career has fizzled since he’s moved up in weight to 140 and 147. He’s not the same guy that dominated against limited opposition at 130 and 135. Now all that’s left is Broner’s ability to trash talk. He’s better than ever in that department. Pacquiao made a guaranteed $10 million plus a percentage of the profits. Broner got $2.5 million plus a percentage as well. Just how much extra Pacquiao and Broner will wind up with is anyone’s guess. What they both made with their guaranteed purses was quite good, especially Pacquiao. Getting $10 million to fight a fading ex-champion like Broner is a lot of money. Younger lions like Spence and Thurman aren’t making that kind of money, and those guys would likely beat Pacquiao if given the chance to fight him. The 400,000 PPV buys is a positive for Broner’s career, because he’s going to continue to be given chances to fight other top fighters a 147. Just how much longer Broner will be useful as a B-side opponent for the elite level fighters to beat is unknown. There has to be a point diminishing returns where the boxing public turns up their noses when Broner is matched against someone that he belong in the ring with. The fans will likely get upset if Broner winds up challenging Spence for his IBF title or WBA champion Keith Thurman for his belt in the near future. Broner has got to start winning some fights against elite level fighters for him to continue to be useful as an opponent for the stars.